Sometimes, however, problems are not so easy to fix. Take, for example, customer service. We've all experienced times (as customers) when we've felt like we're being passed around from person to person, trying to find a simple answer to our question. By the time we get our answer, we're so frustrated with the process that we end up completely annoyed with the company. This damages the company reputation and may even cause us to stop doing business with them. As a business leader, you need to realize that these kinds of deep, penetrating problems cannot be fixed with simple, one-size-fits-all solutions. 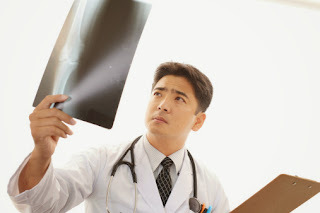 Sometimes, you need to look deeper and see where the 'bone' is broken -- and how badly -- before you can begin to treat the symptoms and heal your company. Only after you have a clearer picture of what's really going on can you find the right way to fix the problem and make your company stronger for the long run. If your company is facing a major problem that can't be fixed easily, don't be afraid to go back and start over in finding the solution. While it can certainly be intimidating to think about how long the process will take and how much potential revenue you might lose along the way, it's important to remember that taking the time to complete these repairs properly will make your company stronger over the long haul. This, in turn, will help to boost revenue and make up for lost time. Companies that neglect to make difficult but necessary changes often find themselves losing money (and customers). Educate and retrain all members of the organization about the new methods and procedures, so everyone is on the same page, even those who aren't directly involved with the affected areas. Growing a business sometimes means being willing to go back to the drawing board to see how a key part of the business can be changed and repaired to make it stronger in the future. Don't be afraid to 'x-ray' your business and find ways to help it grow in the years to come.